How many red light bulbs does it take to light up a heart on Bridge Square? 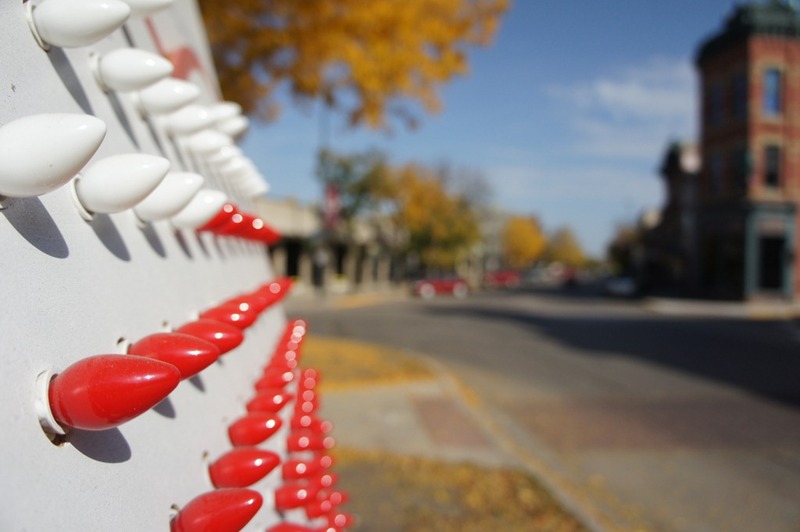 Laura Baker Services Association (LBSA) now has a big fundraising board on Bridge Square. 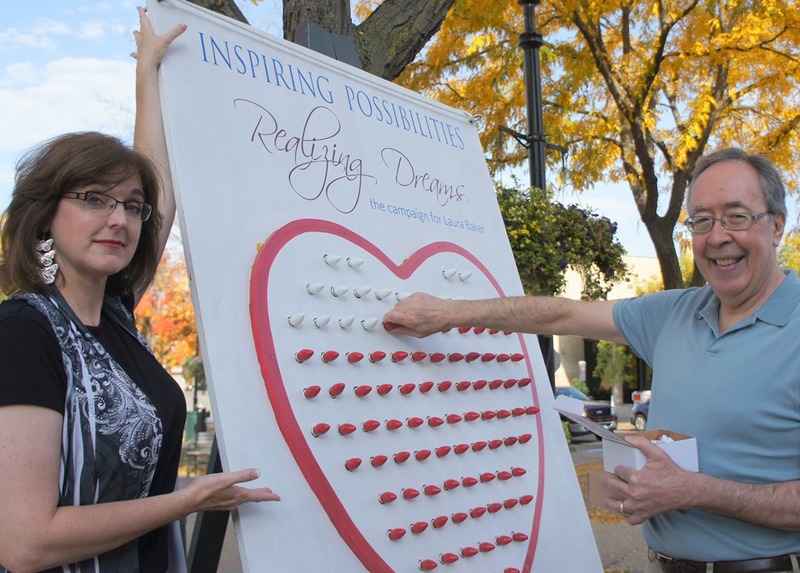 The light bulbs in the shape of a heart change from white to red as the "Inspiring Possibilities, Realizing Dreams" campaign gets closer to the goal of $1,300,000. They’re currently at about 82% there. Jane Fenton, LBSA’s Director of Community Relations, and Paul Krause, fundraising consultant, were overseeing the high-tech installation process (take bulb out of box; screw it in; repeat as necessary) at around noon today. Our goal is to construct two new cottages, just like Wright Cottage and to renovate Elwell and Baker Halls. Once the new cottages are built, the aged Margaret Graves Hall will be razed and a beautiful Recognition Garden created in its place. More fundamentally, we are creating homes for our Oak Street clients, a place where they can dream and be inspired and where the staff can work with them in ways not possible today. To date, we have already completed the restoration and Elwell and Baker and now move forward to make the new cottages a reality. Please help make this dream come true, for our clients, for Laura Baker Services and for our entire community. See the Making the Case (PDF) document for more details and the four videos by Cheryl Buck, Bob Bonner, Sandi Gerdes and Eric Stratton about the campaign. 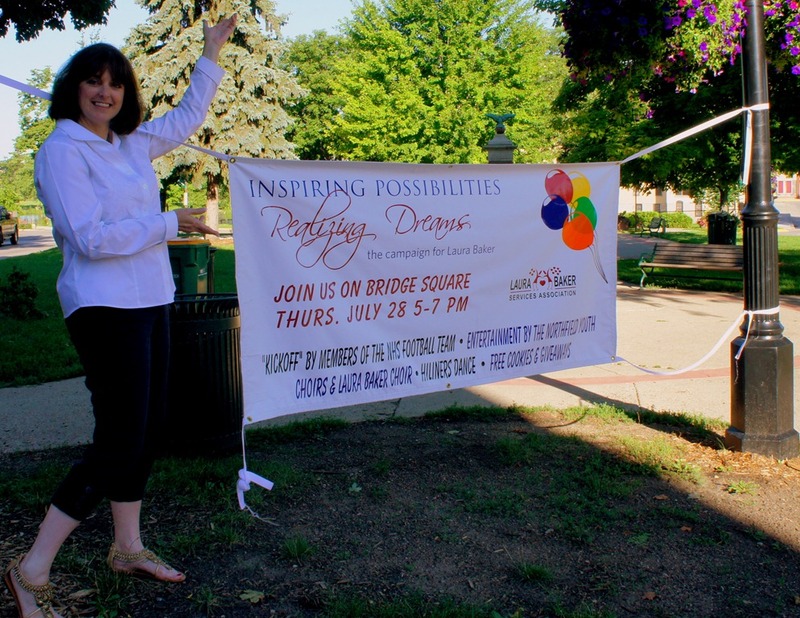 I took this photo early this morning of Jane Fenton, Director of Community Relations for Laura Baker Services Association (LBSA), doing a Vanna White imitation in front of the big banner on Bridge Square that’s promoting the kickoff of their capital campaign, this Thursday night right after Crazy Daze. Please join us this Thursday on Bridge Square from 5-7pm as we kickoff the public phase of our capital campaign. 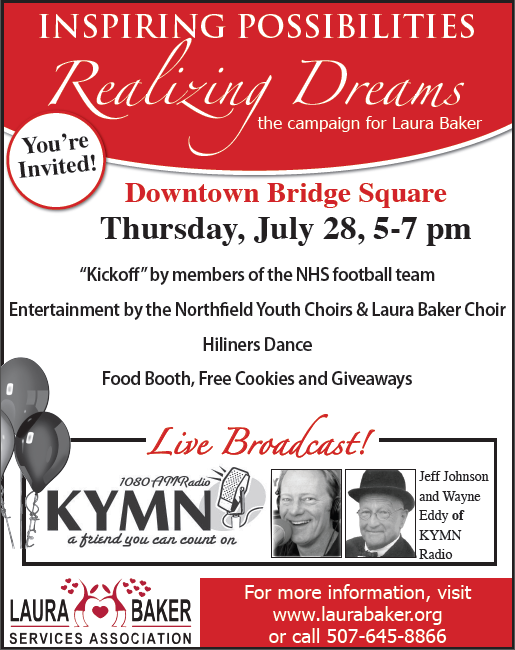 We have the Laura Baker choir, the Northfield Youth Choir, Hiliners and more. Members of the NHS football team will be on hand to “kick off” a ceremonial football as we unveil our dramatic “Heart of Progress”! Food booth provided by Knights of Columbus! LIVE radio broadcast by KYMN Radio!